Robometricschool. - Knowledge from smartphone technology in CES 2013. Not like as smartphone commonly, that this smartphone having two screen from LCD and E-Ink. And i think it is the first smartphone now with two screen. The name of this smartphone is YotaPhone from Yota company, Russian. Although Popslate has been launching case with E-Ink screen for iPhone 5, that can display image in back part of iPhone 5, but it is difference with YotaPhone. YotaPhone use two screen that make from LCD in front and E-Ink screen in back part of this smartphone. So you can use this smartphone with two screen. 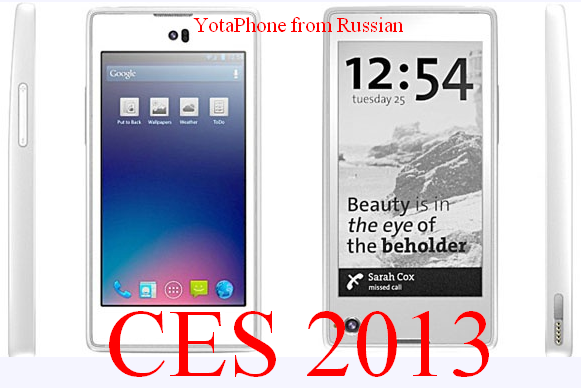 YotaPhone is advance innovation smartphone in this year 2013 and introducing in CES 2013. Not only advance innovation but it is also recent innovation in smartphone product that coming from Russian companies. Maybe we not hear before smartphone from this country. YotaPhone will take part in competition smartphone gadget in this year 2013. YotaPhone using two screen, these are 4.3" LCD display Gorilla Glass with resolution 1280×720 and E-Ink with resolution 200DPI. YotaPhone using Android OS modification that can run in E-Ink screen although it will not maximal operation because E-Ink using White-Black screen. Using Processor Qualcomm dual-core Snapdragon S4 1.5 GHz, RAM 2GB, and internal memory minimum 32GB or 64GB without micro-SD. E-Ink used to image also can give information via API, it will make user can open application like books, playlist,etc. Main camera 12 MPi and in front of this smartphone using camera that can record video with resolution 720p. YotaPhone having weight 140 grams included internal battery 2100 mAh. 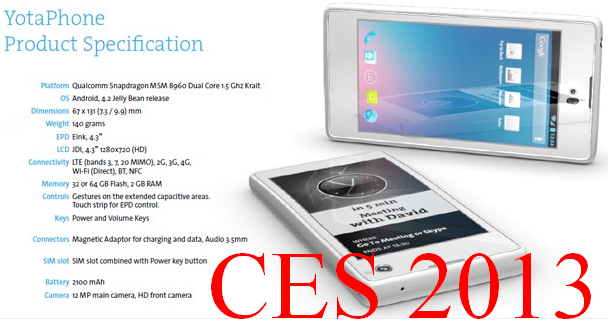 With now specification and advance innovation technology smartphone YotaPhone that also displayed in Customer Electronic Show CES 2013, it will make more competent competitor in this year 2013. For more we can try this smartphone with recent technology innovation. wow that is really new innovation... will it sell in Indonesia?